Tag Archives for " Uber "
There are a million great reasons to quit your job to travel the world, but here are five things that matter right now. There’s never been a better time to get out and experience the world. 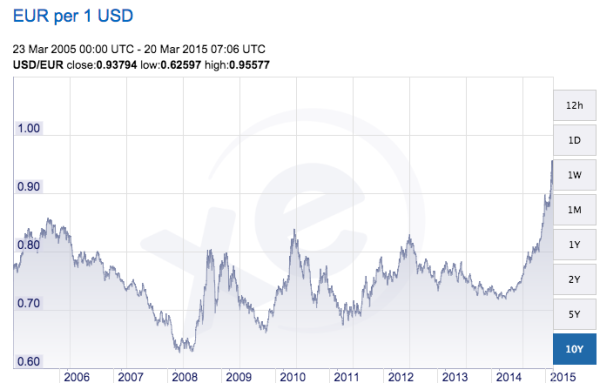 #1 The US Dollar-Euro Exchange Rate is at a 10-year best. While traveling in Europe is the quintessential trip–and much cheaper than most Americans tend to think–the catch has always been the 25-30% ‘tax’ on travelers coming from the US in the form of the Euro-Dollar exchange rate. But things have changed in the last 6 months, and dollar is now as close to the Euro as I’ve ever seen it. As I write this a dollar is worth about 0.94 Euro.